Just all round a great hostel for anything, chilling out, partying, meeting people and walking distance from the town or a supermarket. They have pool and beer pong, surfing and a nice place for a good BBQ. Id defiantly go back, was alot of fun. Great location, staff and facilities. Only negative was that the 4 person dorms are tiny! The surf lessons are great and definitely a must-do. Amazing location and beautiful view of the ocean from the common areas, very friendly staff throughout our stay. Definitively would recommend it! Great hostel, really good atmosphere, amazing location with beautiful views, staff are really cool and help with organising activites etc definitely would stay again !! Hostel has an amazing vibe, staff is very friendly, lots of parties! Located right at the beach which is nice. Would always recommend if you're down for some drinks. Stayed in a 4 dorm, room was quite small but left enough space to store backpacks. We really enjoyed our stay with island vibe , the only grumble would be that we didn’t have a secure door on our hostel room , it was a sliding door that lead straight into the courtyard where people hung out so anybody could easily access the room without a key ! But great hostel !! Lovely place. If you are staying in a private room, go for the ensuite in the main compound. They have an additional house down the road we were originally supposed to stay in due to a mix up at check in and it didn't have the same facilities, nor did it feel nearly as safe. Good vibes, food and drinks. Definitely a party hostel, which has its pros and cons depending what you are looking for. Suitable for couples and solo travelers. Really helpful and friendly staff. We also had some surf lessons from their in-house surfing instructor, and had the best time - Ryno really was lovely instructor and we got the hang of it quickly. Great vibe, lots of people. 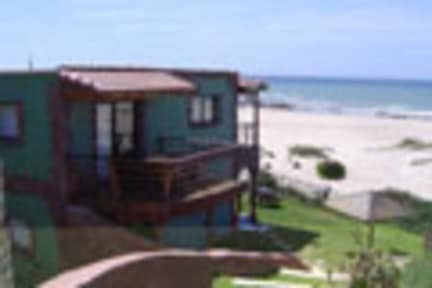 Located right on the beach, within walkig distance to the swimming area. The best thing about this place is the terrace - it is incredible! Unfortunately for other things I cannot give a good recommendation. The kitchen was dirty most of the time and there were no even proper knives available, in general the kitchen equipment was poor. The dorms close to the bar were loud and dirty. The bathrooms were dirty as well - I think they clean it only once a day (even when more than 70 people stay there). Also some of the employees were unfriendly.